Successfully Added LED Earphones - Hifi Stereo Earphones w/ Music Responsive LED's to your Shopping Cart. LED Earphones - Hifi Stereo Earphones with Music Responsive LED's. If listening to music were just about the music, there would be no demand for expensive iPods. In fact, listening to tunes is also about looking cool and these LED stereo hi-fi earbuds in diamond white are as stylish as it gets. A string of three blue LED lights on each earbud dynamically pulses to the beat of whatever music track you're listening to. Listen to Enya to create a subtle light show or throw on some Elvis Presley for a fantastic light display guaranteed to get you noticed by that pretty girl or cute guy sitting next to you at Starbucks. Don't let the price fool you however. These in-ear headphones sound as good as they look. The CVIH-G59 reproduces deep bass like a pro and richly handles high pitch audio for a brilliant stereo performance of the highest highs and the lowest lows everytime. What's more, these lightweight earphones fit snugly in your ears for hours of comfortable listening pleasure and is ideal for PC multimedia, digital MP3 / MP4 players, CD / DVD players and portable gaming systems. These stereo hi-fi earphones with music driven flashing LED's are the ultimate multimedia accessory in terms of performance, style, and value. Brought to you by the leader in wholesale direct from China electronics, Chinavasion. 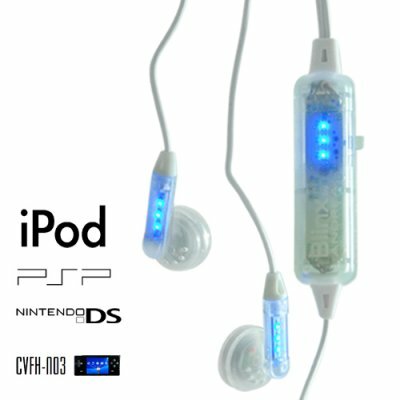 Primary Function: Earphones for portable audio systems such as iPods and other MP3/MP4 players, CD / DVD players and portable gaming systems like the Nintendo DS, Sony PSP, or the very popular CVFH-N03 - Multi Platform Portable Gaming Entertainment Station from Chinavasion. LED power source: (2) high current 7mm button batteries. Normal earphone functions do not require the use of batteries. Based on OEM agreements, this item cannot be sold to customers in North America. The LED lights in the earbuds are powered by two button style 7mm batteries, the same type used in modern hearing aids. They should give you hours of enjoyment and can be re-ordered online or at your favorite neighborhood electronics specialty store when they stop powering the LED's. We encourage customers to purchase at least 10 pieces in order to receive the absolute best resale profit margin from the low sale price and even better shipping rates. How can I tell how good the audio quality will be without testing them first? Audio testing is a very subjective experience. Some listeners may enjoy the sounds produced by a particular earphone model, while others may not. In testing these headphones, we tried to be practical about the listening experience. That is to say, we were on the lookout for the sizzle and crackle when headphones aren't able to handle deep bass sounds and the tinniness one hears when earbuds can't handle high pitches. The music player used for testing was a 1 GB iPod Shuffle (purple). The track used was Led Zeppelin's Rock and Roll. The outcome was that these earphones provided an exceptional listening experience for what is possibly one of the most exciting musical tracks of all time. Why did you choose Led Zeppelin's Rock and Roll instead of other songs for testing these earphones? In the past, we've used Dave Brubeck's Take Five as well as Miles Davis's So What. This time around, we wanted a track that would give these earbuds an all around speaker workout. From Robert Plant's wailing vocals to John Bonham's frenetic drum sequences, the CVIH-G59 transformed an otherwise lossy MP3 track into a masterful sound dreamscape. Do the earbuds function without batteries? Yes. The button batteries are necessary only for the LED function and their absence does not impair the normal operation of the earphones in any way. Do you have any track recommendations that would adequately manifest the potential of these amazing earphones? Yes, yes we do. Here's a playlist of well-arranged tracks which should give your new CVIH-G59 earphones a vigorous audio workout. How long will the LED's last? The LED lights should last for many years.